Financial aid is available for most study abroad programs. If you are interested in enrolling in a study abroad program, contact the Office of Studies Abroad. It is important when studying abroad to think about all the costs associated with your program in order to include those costs in your budget. Please use our 18-19 Study Abroad Calculator or 19-20 Study Abroad Calculator to help estimate your costs and create a budget for studying abroad. Institutional (except Tuition Exchange), federal, and state aid are available for use in any academic year institutional study abroad program. 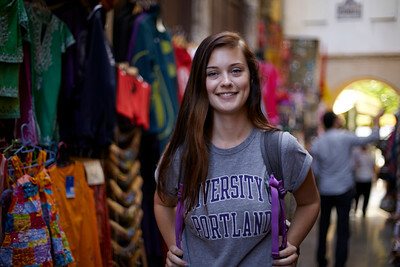 The University of Portland also offers summer study abroad programs. Only federal financial aid (loans and grants, for students who qualify) is available for summer institutional study abroad programs. Please refer to the studies abroad website for a complete list of UP summer programs. The Institute for European Studies (IES) offers students opportunities to study abroad in a wide variety of locations not available through the Institutional Study Abroad programs. The University of Portland has only a partial consortium agreement with IES. Therefore, only federal and state aid (loans and grants, for students who qualify) may be used for most IES programs. However, French majors studying abroad with IES in Nantes, France, during a fall or spring semester are eligible for institutional (except Tuition Remission and Tuition Exchange), federal, and state aid as long as they are approved by the studies abroad office. Only federal financial aid (loans and grants, for students who qualify) is available for summer IES study abroad programs, including programs in Arles and Paris, France. There are numerous study abroad programs that do not fall into the previous categories. Any program that does not qualify as institutional or IES would be categorized as "other." No institutional, federal, or state aid can be used for these programs through the University of Portland. Check with the host institution for aid options available through their Office of Financial Aid. Students should complete the Non-UP Study Abroad Checklist which can be obtained from the Office of Financial Aid. Only students majoring in political science who have the director of the AU program's signature endorsing their application for the Washington Semester program at AU are permitted to receive transfer of financial aid from University of Portland to American University. Such students will be permitted to transfer their institutional and federal aid to American University. Students should complete the Washington Semester at American University Checklist which can be obtained from the program director.